We're sorry; this specific copy is no longer available. Here are our closest matches for Theophrastou Charakteres ethikoi. 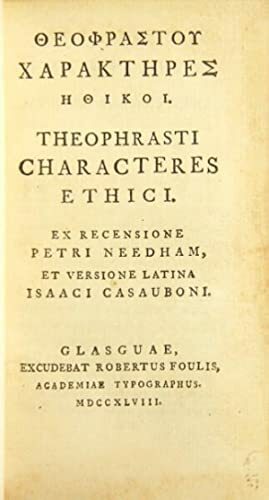 Theophrasti Characteres ethici by Theophrastus. 3. Theophrastou Charakteres Ethikoi. Theophrasti Characteres Ethici. Ex Recensione Petri Needham, Et Versione Latina Isaaci Casauboni. 5. Theophrastou Charakteres Ethikoi. Theophrasti Characteres Ethici. Ex Recensione Petri Needham, Et Versione Latina Isaaci Causauboni. 6. Theophrastou Charakteres Ethikoi. Theophrasti Characteres Ethici. Ex Recensione Petri Needham, Et Versione Latina Isaaci Casauboni. 8. Theophrastou Charakteres Ethikoi. Theophrasti Characteres Ethici. Ex Recensione Petri Needham, Et Versione Latina Isaaci Casauboni. 10. Theophrastou Charakteres Ethikoi. Theophrasti Characteres Ethici. Ex Recensione Petri Needham, Et Versione Latina Isaaci Casauboni.